Bentley Motors is delighted to confirm its role as the main sponsor of the inaugural Windsor Concours of Elegance - a unique gathering of 60 of the world's rarest and most desirable cars - taking place in the beautiful grounds of Windsor Castle between 7-9 September 2012. Royal Warrant Holders and manufacturers of Her Majesty Queen Elizabeth II’s State Limousine, Bentley is supporting exhibitors throughout the Concours event (www.concoursofelegance.co.uk) by hosting the Pegasus Club, a VIP reception and dining area with a Bentley theme inside the Castle walls. 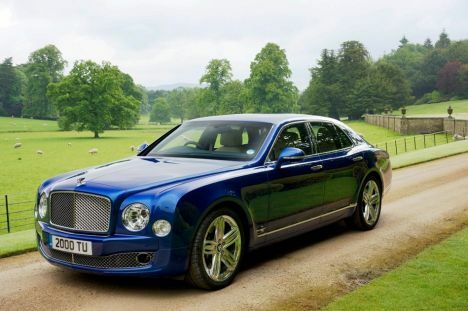 The company’s latest flagship, the award-winning, hand-built Bentley Mulsanne will also play a prominent role chauffeuring owners and their guests throughout the event. A significant number of cars taking part in the Concours, including six remarkable Bentleys such as the staggeringly beautiful Embiricos and W.O. Bentley’s masterpiece the 8 Litre saloon, have been sourced from private or manufacturer collections as well as overseas museums and have been seldom shown in public; clearly underlining the special nature of this opening Concours. “The Windsor Castle Concours of Elegance is of a quality and prestige unprecedented in the UK and will rate among the finest events of its kind anywhere in the world", says Peter Wallman of RM Auctions, the official collector car auction partner for the Windsor Castle Concours. “For anyone wishing to see 60 of the finest motor cars in the world, this exceptional event will provide that opportunity. Bentley’s remarkable contribution to the history of elegant, luxury motoring will feature strongly and its key support of this first Concours is both welcome and fitting,” adds Wallman. The Windsor Castle Concours of Elegance and its sponsors will support several key charitable organisations dedicated to helping children and their carers facing life threatening or limiting illnesses including The Royal Marsden Cancer Charity and East Anglia’s Children’s Hospices.